Kaira Muraoka-Robertson '16 leaps into the air. They dropped the first set, but after that, the Wolverines hardly made a misstep in their first round CIF-SS match against St. Joseph. They took the second set 25-12, the third 25-16 and the fourth 25-14. Courtney Nunley ’17 and Mueller provided key plays at net, while Bella Hedley ’18 did a little of everything. She had several kills, digs and serves and rarely left the court through all four sets. 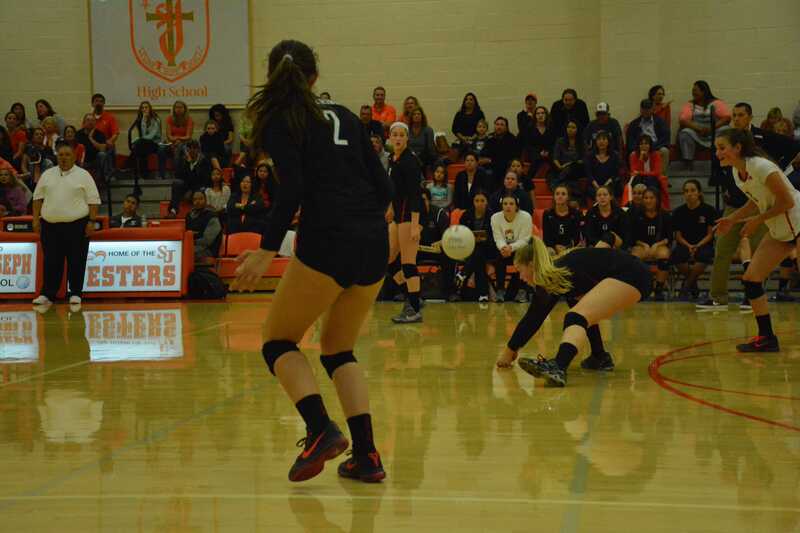 Wolverines will face the winner of the Temecula Valley – Huntington Beach match in second round CIF playoffs this Thursday.